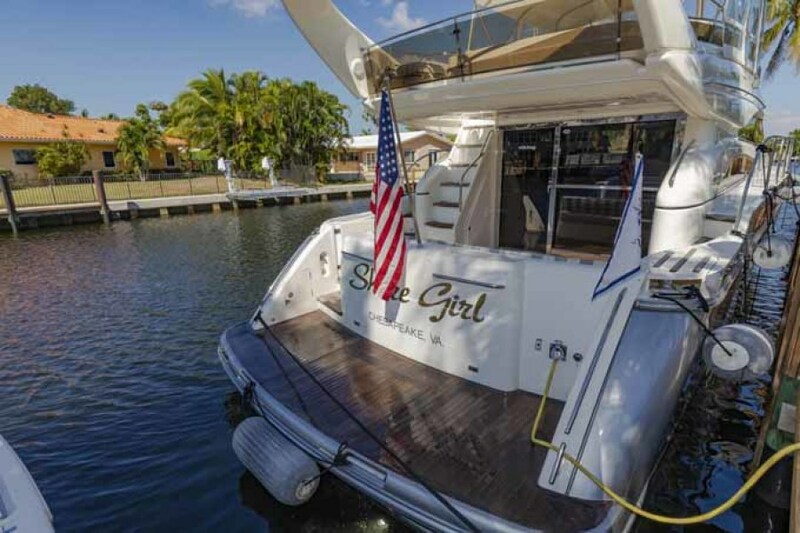 SHORE GIRL was recently acquired via a trade down from a larger vessel.That said the new owner has little or no emotional attachment to the boat.SHORE GIRL is clean, well presented and offers recently replaced teak decking, recent hull paint and a very practical three staterooms three head interior arrangement.Brought to Ft. Lauderdale to be sold!Now available on a three (3) year lease purchase. 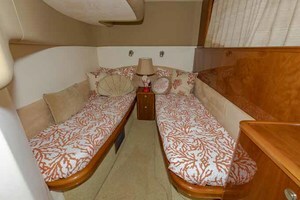 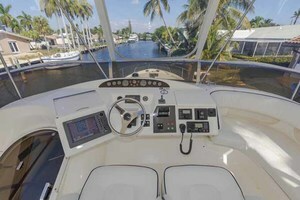 United Yacht Sales New Jersey would love to guide you through a personal showing of this 61' Viking Sport Cruiser 2003. 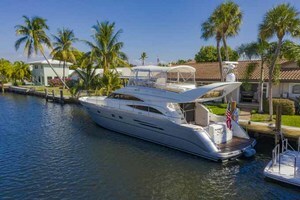 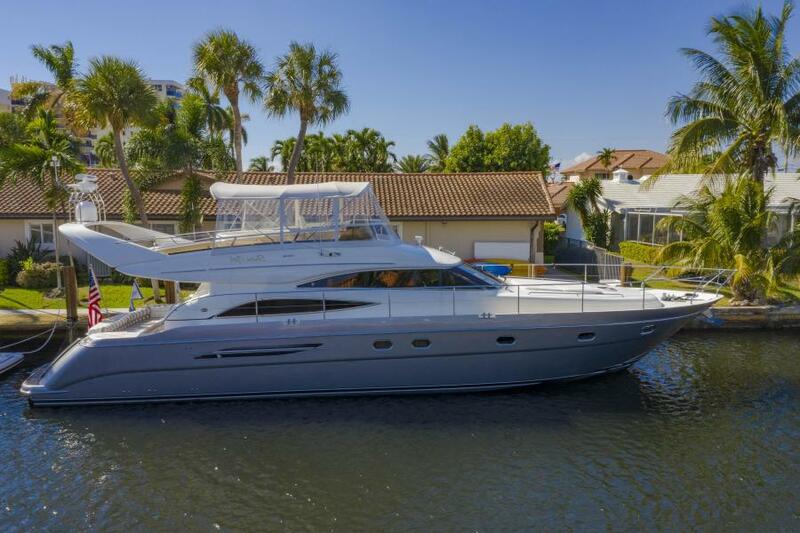 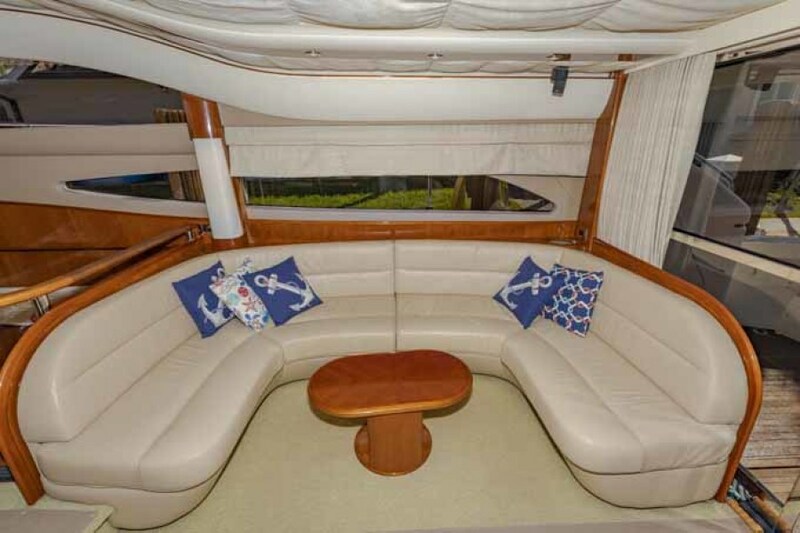 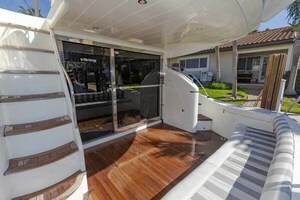 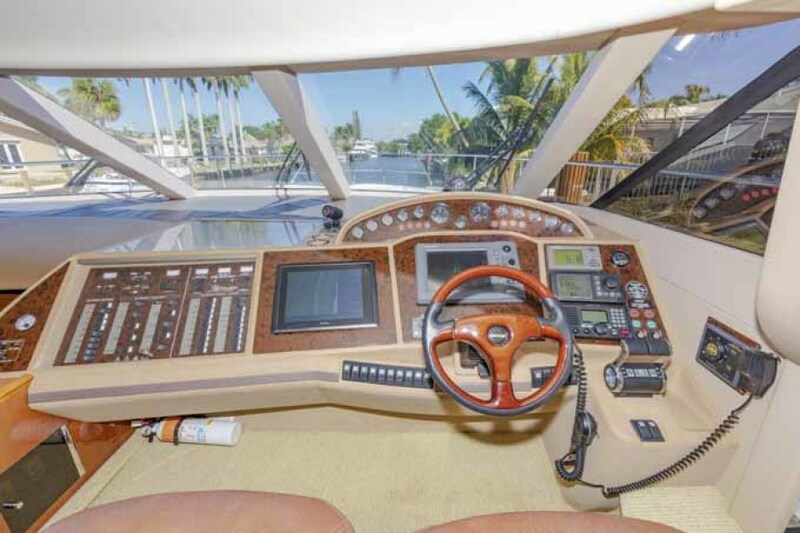 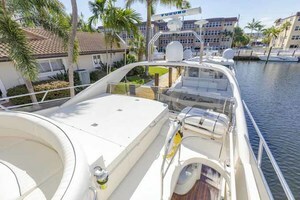 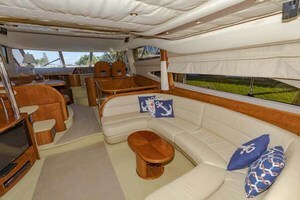 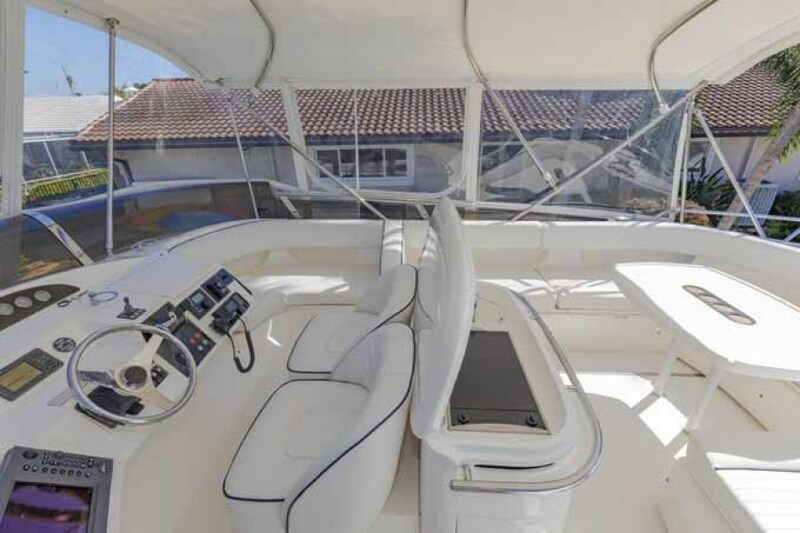 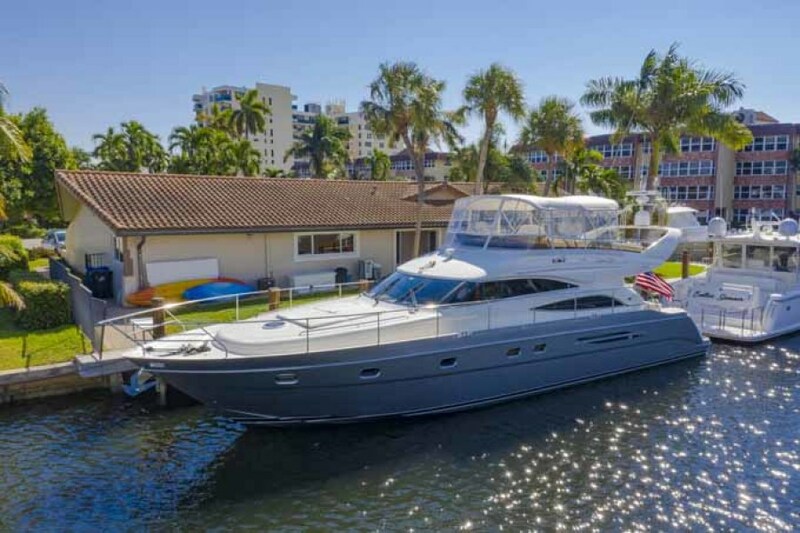 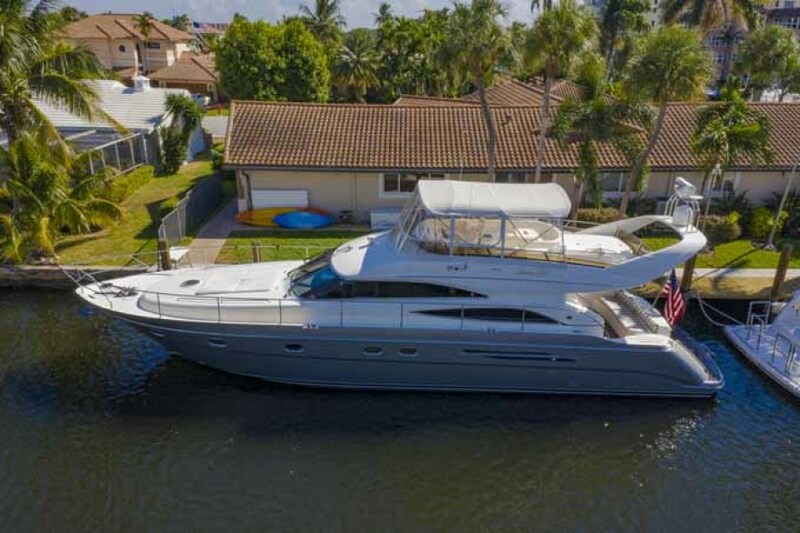 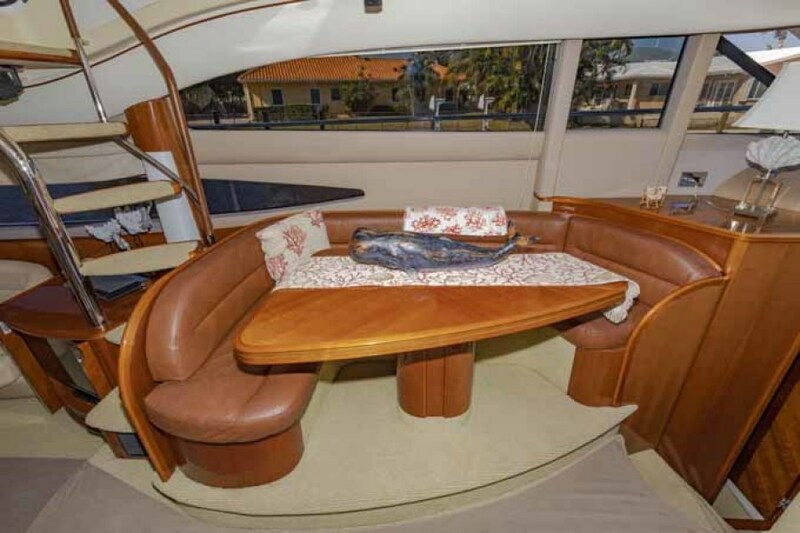 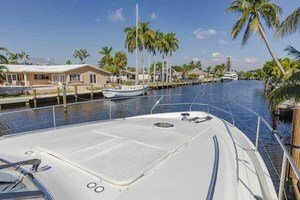 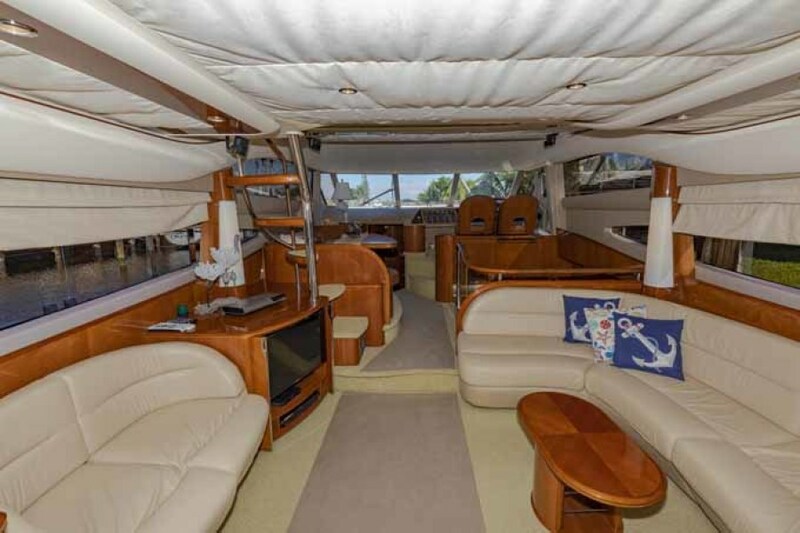 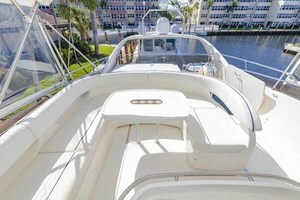 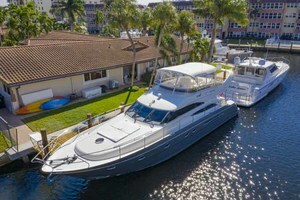 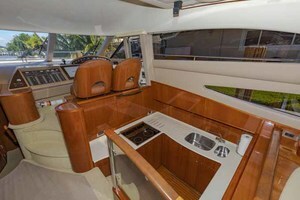 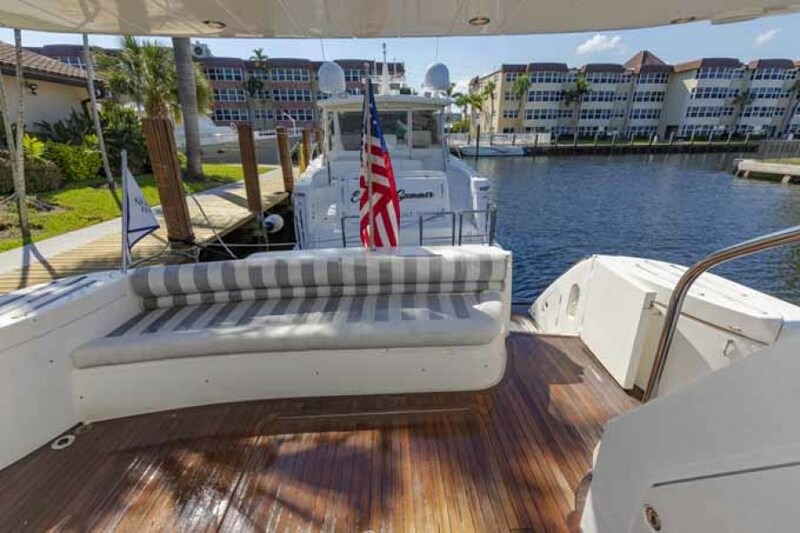 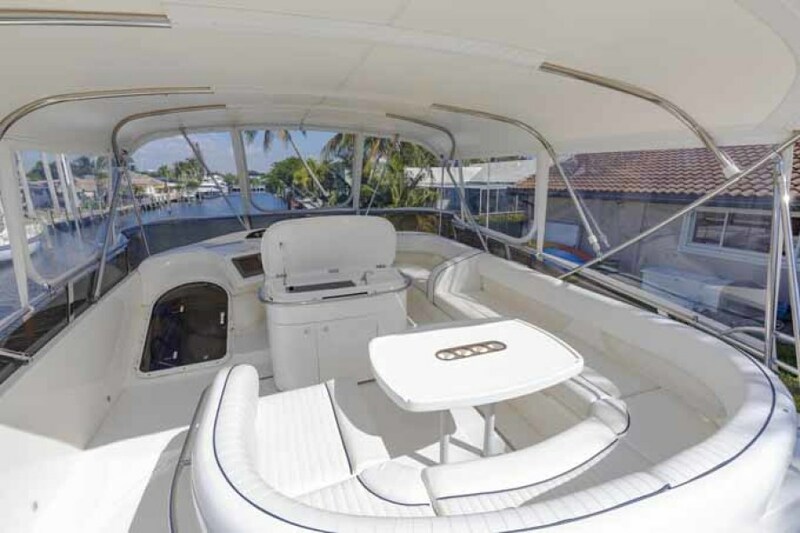 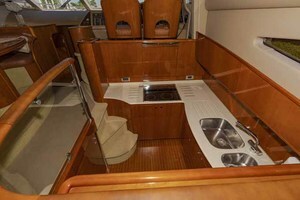 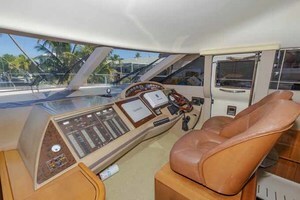 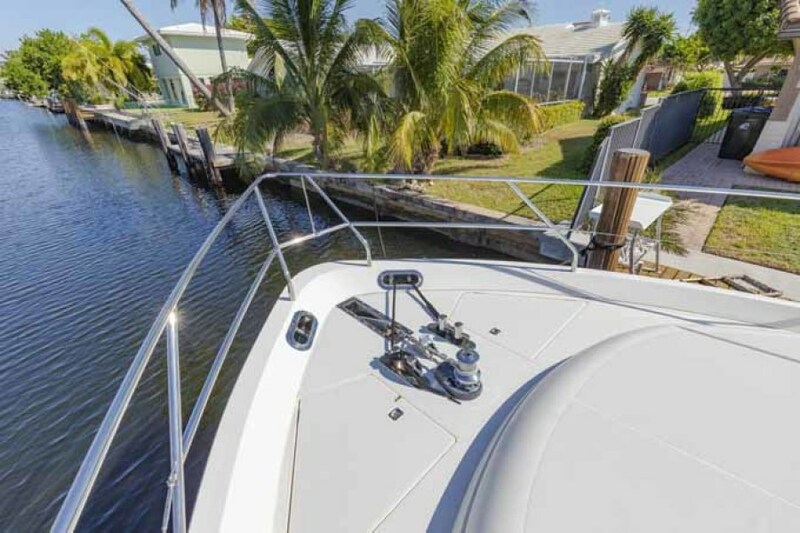 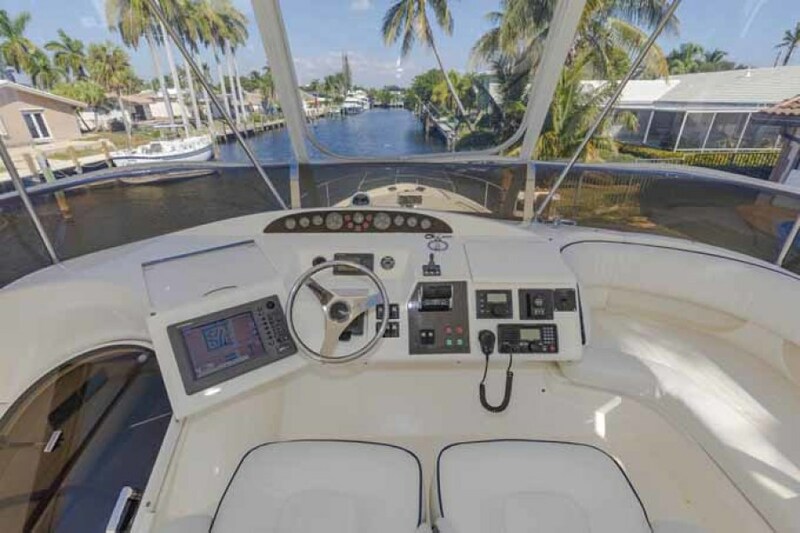 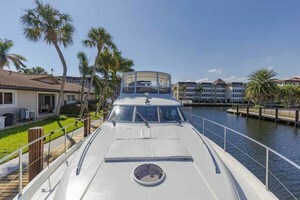 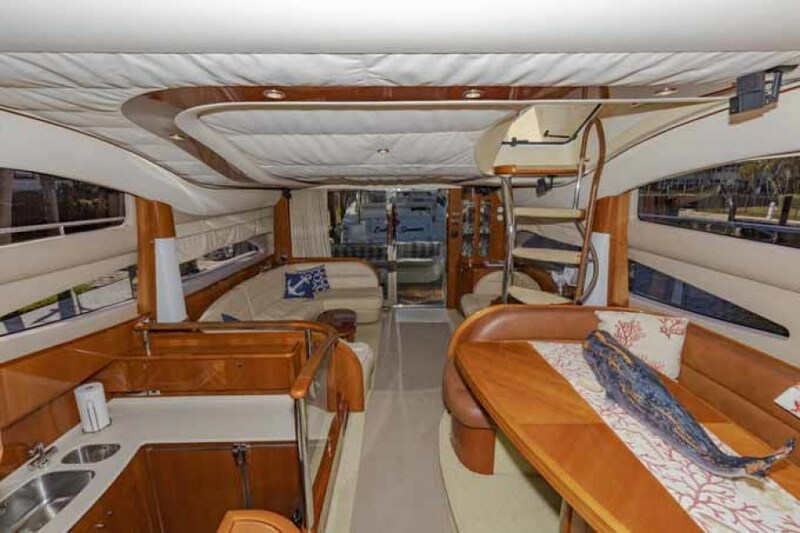 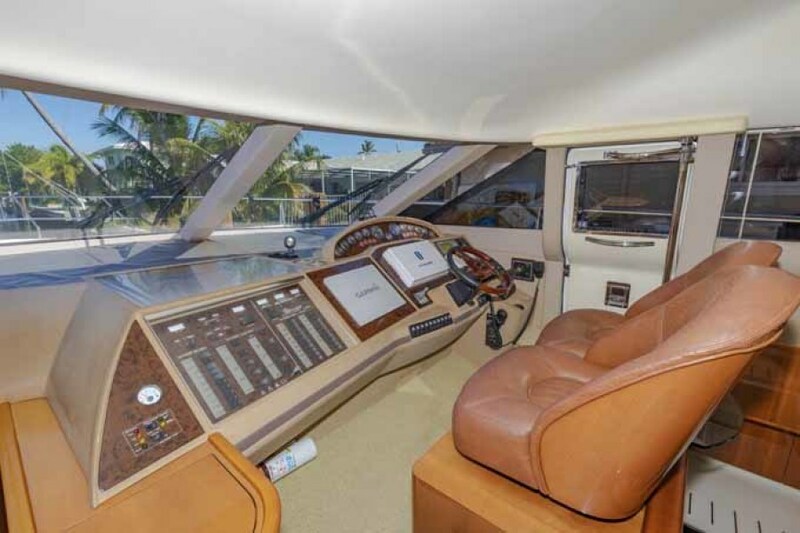 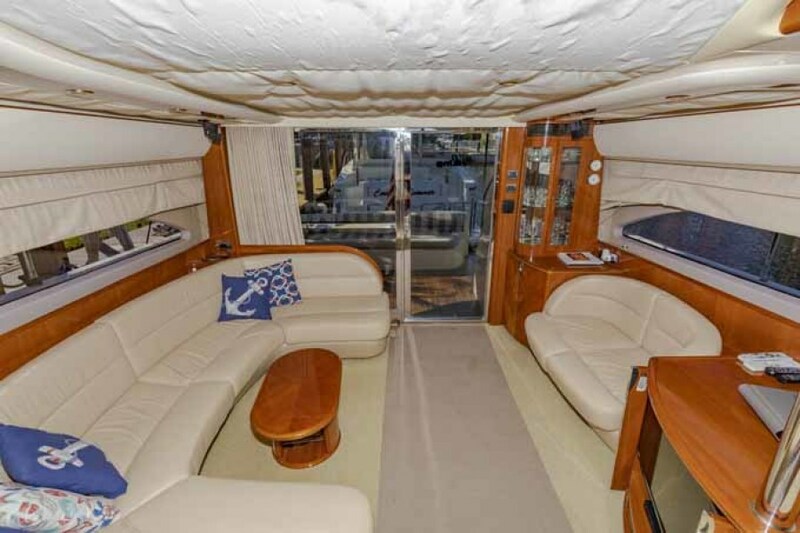 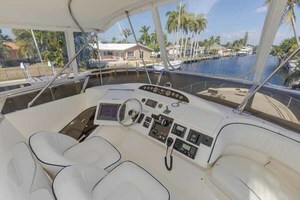 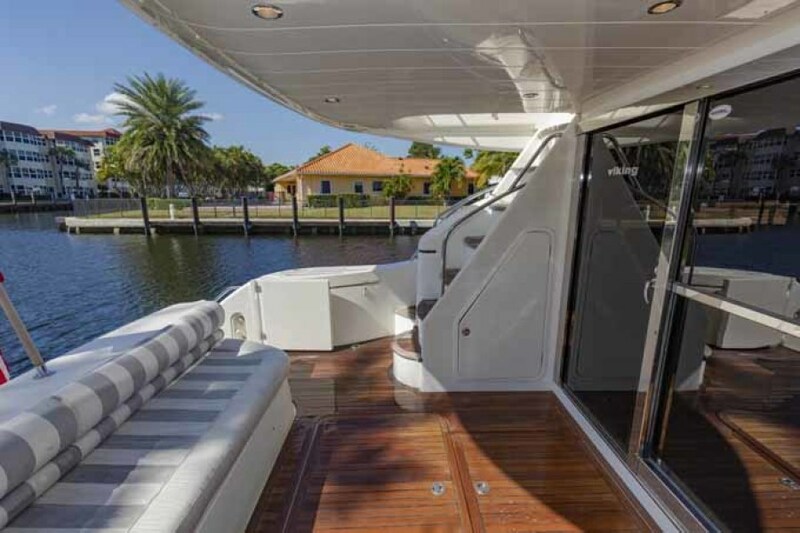 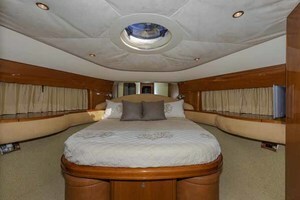 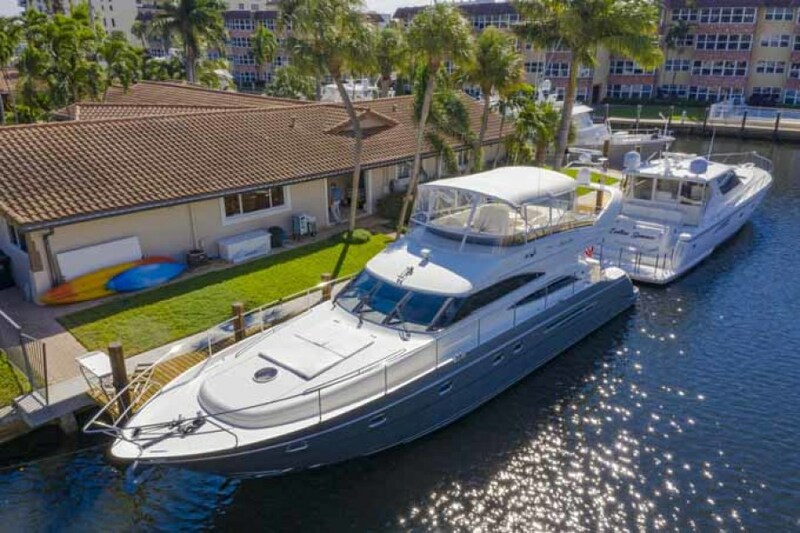 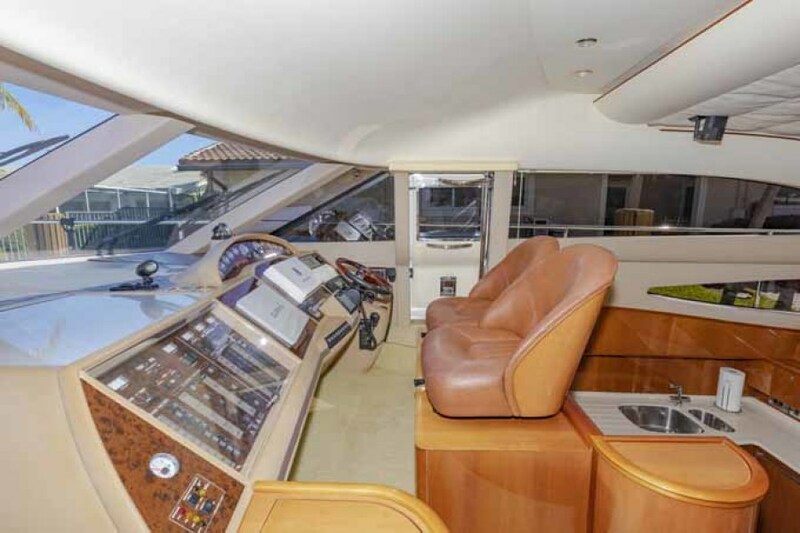 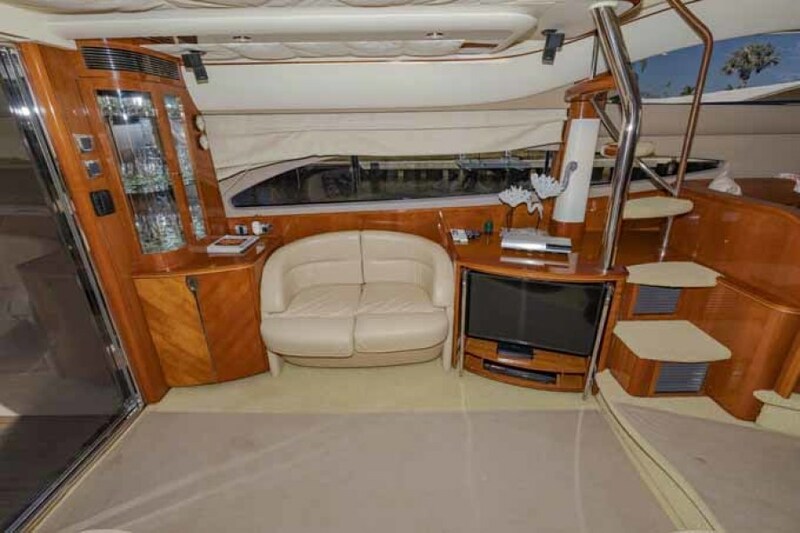 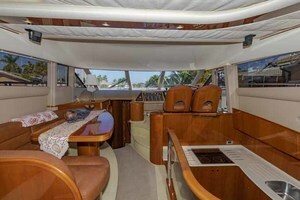 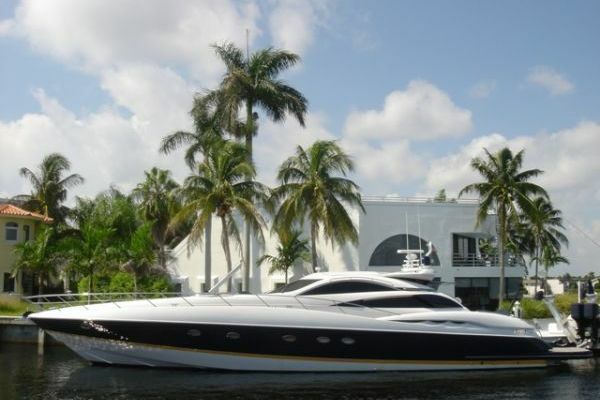 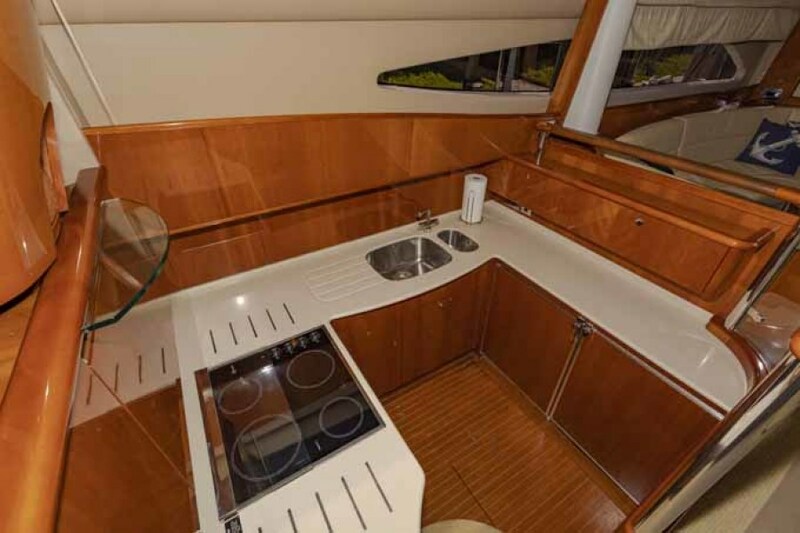 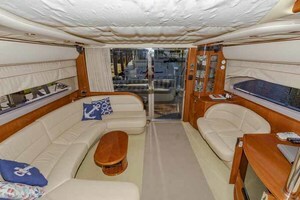 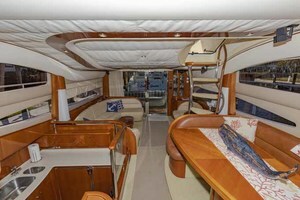 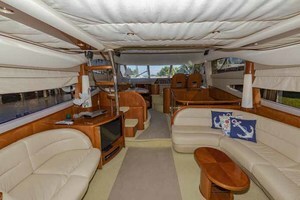 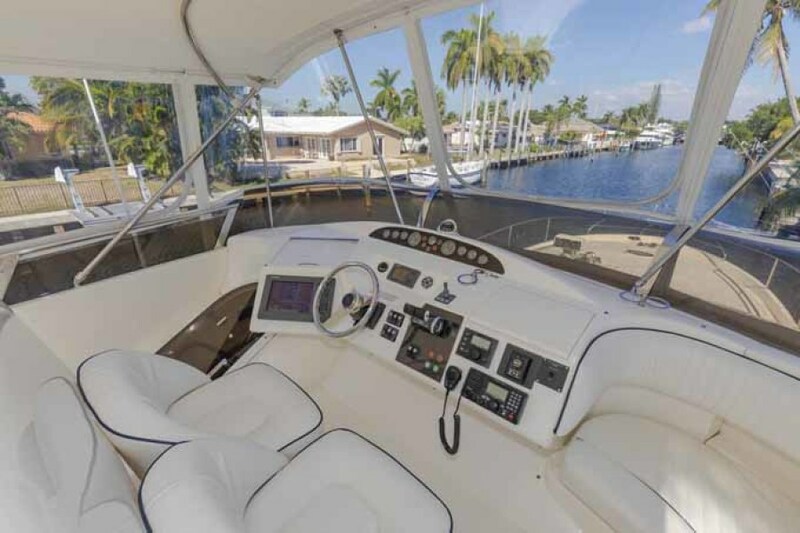 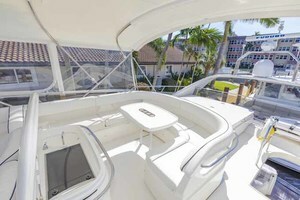 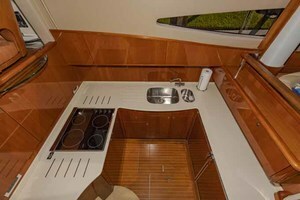 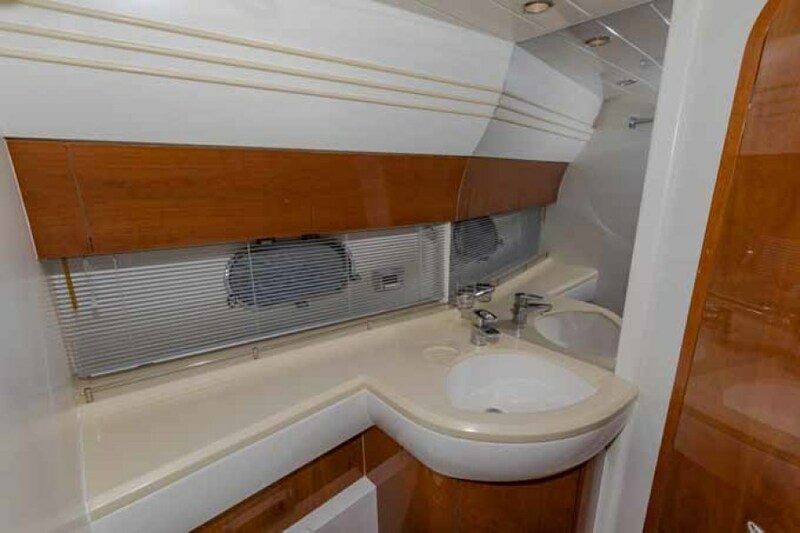 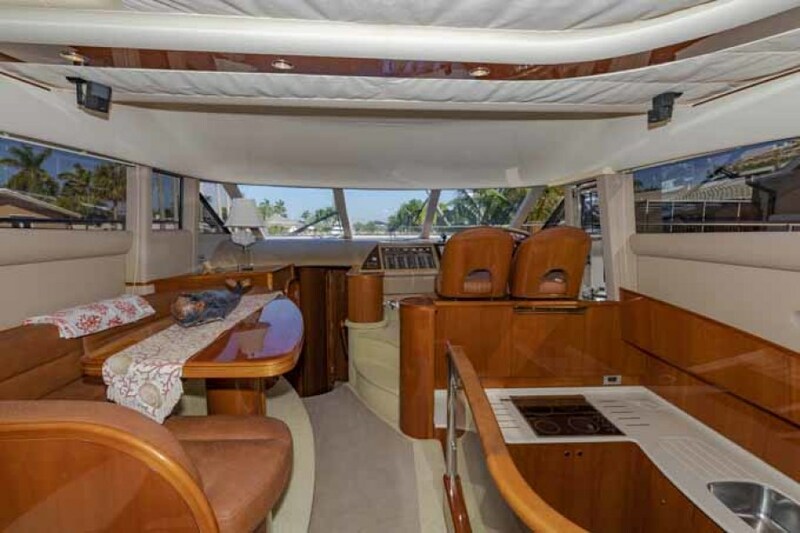 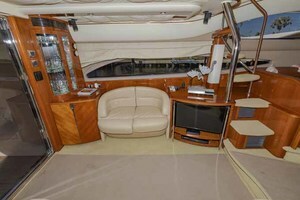 This yacht for sale is located in Fort Lauderdale United States and priced at $589,000. For a showing please contact us by filling out the form on this page and we will get back to you shortly! 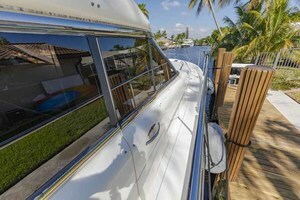 Boarding SHORE GIRL from a floating dock is onto the swim platform and to the portside boarding door to the Aft Deck.From a fixed dock one can board over the port or starboard gunwale.The Aft Deck and platform have recently laid teak decks much thicker than originally supplied.The Aft Deck has fixed seating, a dining table, loose chairs and comfortable steps to the Flybridge.Hatches below lead to the Engine and Generator Rooms.The Salon is entered via a sliding glass door with a large U shaped settee to starboard and matching loveseat to port.Open tread steps give secondary access to the Flybridge, rare on a yacht of this size.Next forward to starboard is the Galley, recessed below but allowing anyone working there to very much be a part of the action in the Salon.Next forward is the Lower Helm with two bucket helm seats.To port is an L shaped Dining Area with table.Centerline are steps to below.The Master is aft to starboard with a walk around queen size berth and a private Head and shower.To port is a twin lower berth Stateroom also with a head and shower, that also serves as the Day Head.All the way forward is the VIP Cabin with an island queen berth and a private head and shower.The Flybridge has two access points, from the Salon or the Aft Deck.The helm is centerline.A large J shaped seating area is to starboard.Aft is a large two to three person sun pad with great storage below. 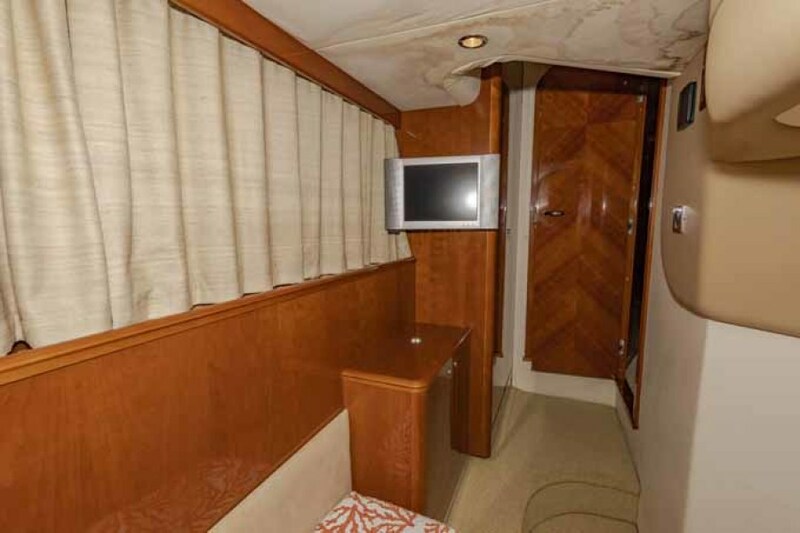 The Salon is entered via a sliding stainless steel trimmed door to port.The other two thirds of the bulkhead opens via the upper half electrically sliding down.The entire door area is covered by lined drapes.Once inside to starboard is a large four to five person Ultra Leather eggshell colored sofa.Outboard of the sofa is a large side window covered by Roman shades.Next forward is a built in backlit sconce light.Immediately upon entering to port is a two door cherry cabinet with an Engle dual voltage bar fridge.Above is a backlit three shelf bar glass locker with Princess glasses behind glass doors with a cherry countertop below.Next forward is a two person loveseat, followed by a cabinet with a 30” Samsung LED TV, a JVC DVD player and an HD Direct TV Sat receiver.Above is a Bose Lifestyle AM/FM/6 disc CD changer with hard drive storage on the cherry countertop.A matching backlit sconce and window treatment is outboard.Next forward are six open tread steps to the Flybridge.Also in the Salon are nine overhead mini spots, Bose stereo speakers and rope lit ceiling detail and carpeted with a Sunbrella runner. 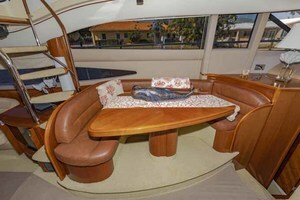 Opposite the Galley and one step up from the Salon is a raised L shaped dinette.The seating surface is ostrich embossed leather.The table is high gloss cherry with a cherry pedestal.The table seats four.Two stools stored elsewhere allow dining for six.Mini blinds cover the double side windows.Above are four halogen mini spots.The carpet in the center walkway is covered with a Sunbrella runner.Next forward is a cherry countertop with a table lamp.To starboard up two steps is the complete Lower Helm Area. 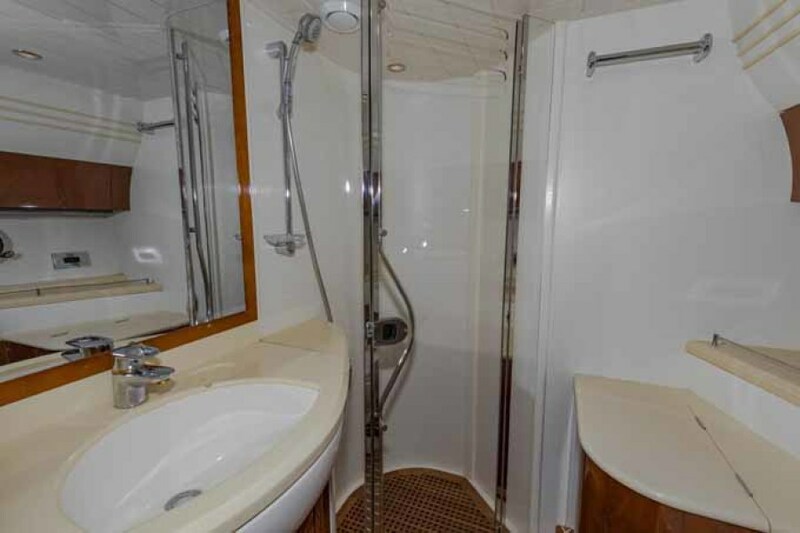 From the Lower Helm Area, down four carpeted steps is the Centerline Accommodation Companionway.First to port is the Twin Lower Berth Stateroom.Next forward is the Guest Head with two doors to also serve as the Day Head.To starboard, down one step, is the Master Cabin with private Head.All the way forward is the VIP Cabin with private Head. 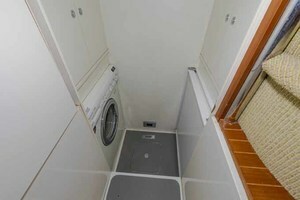 Down two steps is the Twin Lower Berth Cabin.Each berth has a reading light with a two drawer cherry nightstand with table lamp between.Above the outboard berth are two opening stainless steel portholes behind full drapes.Forward of the outboard berth is a two door cabinet with two shelves and a JVC DVD player within.Above is a 15” Sharp Aquos LCD TV.Furthest forward is a hanging locker and four shelves in the adjacent cabinet.On the forward bulkhead is the Guest Head door.Also in this cabin are SMX digital AC controls, three overhead mini spots, a carpeted sole and an arched cherry entry door. 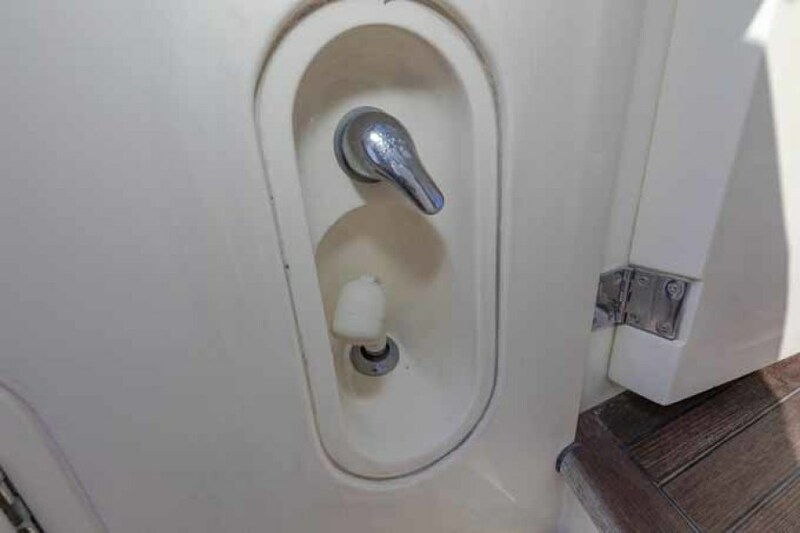 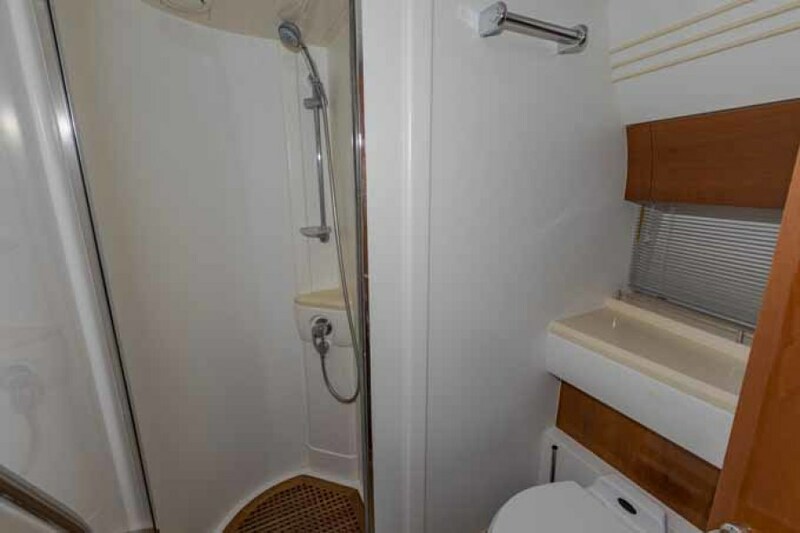 The Guest Head also serves as the Day Head with a secondary entry door from the Main Companionway.The sole is teak and holly.The vanity has one cherry door below and a curved under mount sink in the Avonite countertop above.Silver miniblinds cover the opening stainless steel porthole above.The toilet is a Sealand Vacuflush model.The shower has a clear glass door and sidelights, a seat, a handheld or wall mounted fixture, a teak grate sole and an exhaust fan.Also in the head are two cherry storage cabinets, an AC vent and three halogen mini spots above. 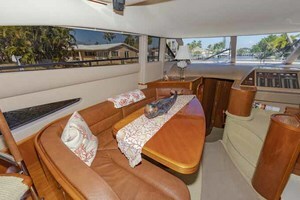 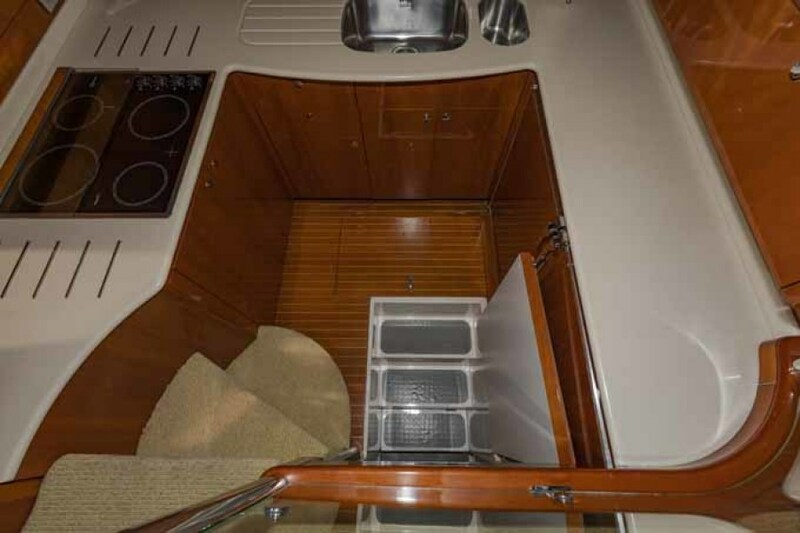 Down one step to starboard from the Centerline Companionway is the Master Cabin.A tapered queen size walkaround berth is off the aft bulkhead.Twin cherry nightstands with storage are outboard.The upholstered headboard spans the width of the berth and nightstands.Two directional reading lights are above.There are two drawers at the base of the bed.Outboard are two opening stainless steel portholes behind full drapes.Next forward is a full size hanging locker with an adjacent six shelf cabinet within is a JVC DVD player.On the forward bulkhead is the entrance to the Master Head and a small vanity table with lift up storage and stool with storage within.Inboard from the berth is a two door cabinet with five storage shelves.Also within the cabin is a 15” Sharp Aquos LCD TV, a JVC AM/FM/CD stereo, two Sony stereo speakers, SMX AC controls, six overhead halogen mini spots and a carpeted sole. 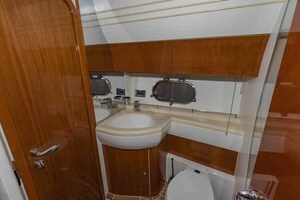 Forward and up one step from the Master is the private Head.The sole is teak and holly.The vanity has one cherry drawer below and an undermount sink in the curved Avonite countertop above.The toilet is a Sealand Vacuflush model.A cherry hamper with a hinged Avonite top is next forward (Euro models have a bidet here. )Outboard of the toilet is a fiddled Avonite shelf with an opening stainless steel porthole behind silver miniblinds and two storage cabinets above.The stall shower has a clear glass door and sidelight, shelf, handheld or wall mounted fixture, an exhaust fan and a teak grate sole.Also in the Head is a huge mirror, five overhead halogen mini spots and an AC vent. 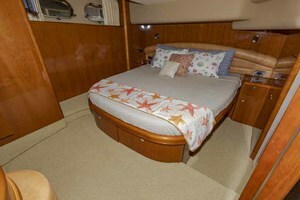 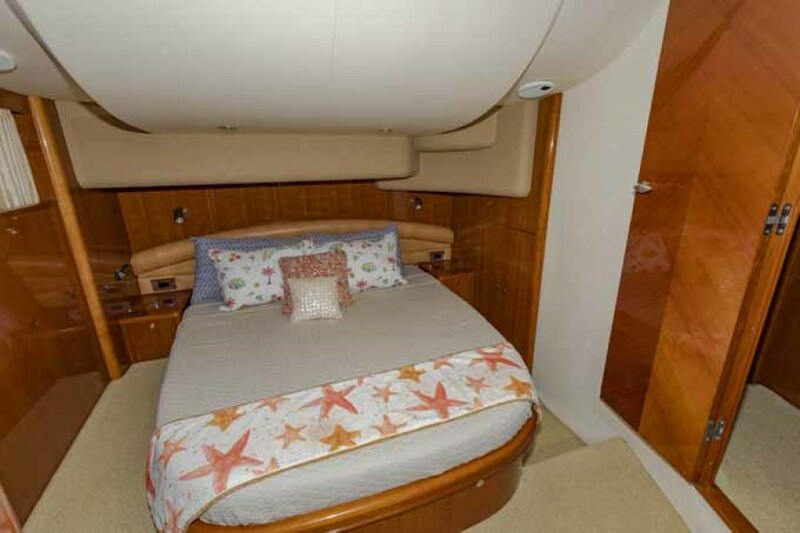 All the way forward is the VIP Cabin with a tapered queen size pedestal berth.An upholstered headboard is mounted on a full beam mirrored panel with directional reading lights port and starboard.Built in shelves serve as nightstands with lift up storage cuddies port and starboard.Above each is an opening stainless steel porthole with full drapes.Above are two hinged storage cabinets each side.Two drawers at the end of the berth are flanked by cut out meant to store the two stools used to increase the dining table to seat six.Aft to port is a double hanging locker, a Sharp Aquos 15” LCD TV and a JVC DVD player.Aft to starboard is a five shelf storage cabinet and the entrance to the VIP Head.Also in this cabin are five halogen mini spots, digital SMX AC controls and a carpeted sole. 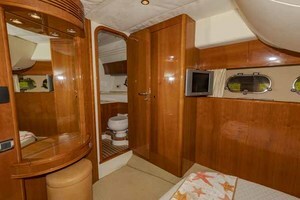 The sole is teak and holly.The vanity has one cherry cabinet below and a curved sink with Avonite countertop above.Silver miniblinds conceal an opening stainless steel porthole.Above are two hinged cherry cabinets.The toilet is a Sealand Vacuflush model.The stall shower has a clear glass door, handheld or wall mounted shower fixture, teak grate sole and an exhaust fan.Also in the Head are four overhead halogen mini spots and an AC vent. 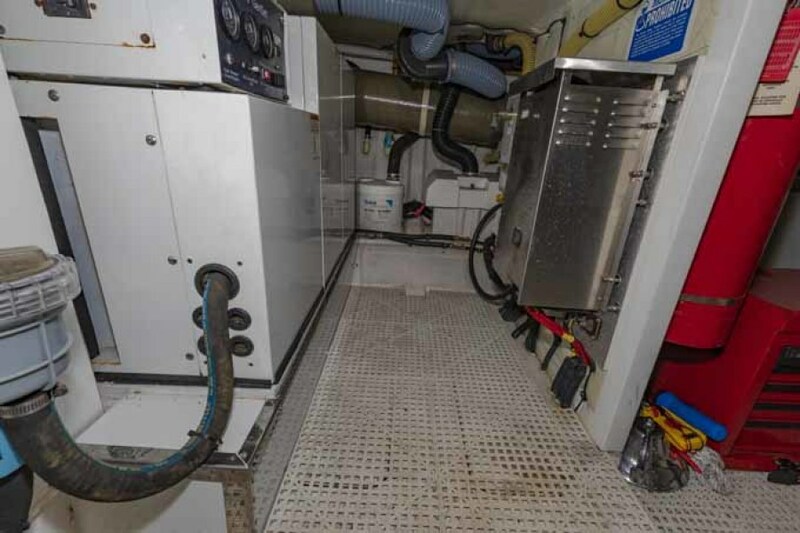 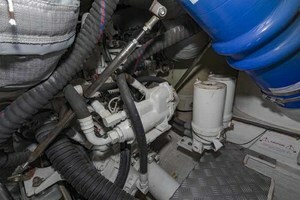 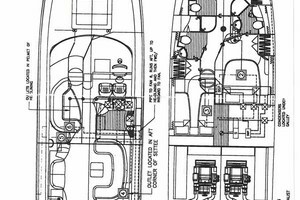 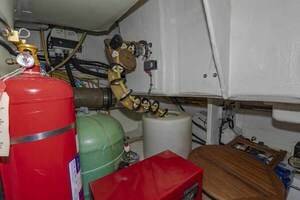 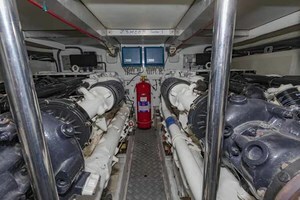 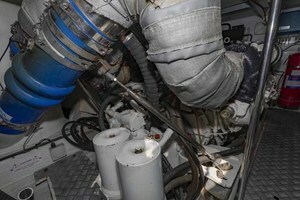 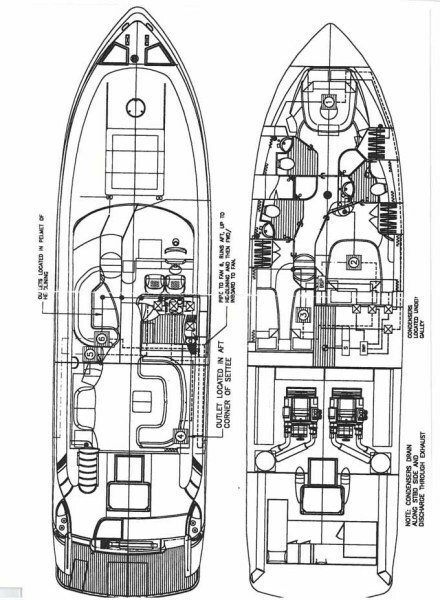 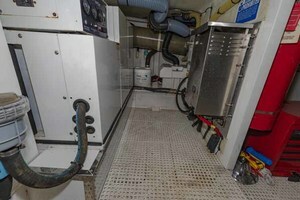 The Lazarette is very spacious due to the look of the rarely used single Crew Cabin.Most of the equipment listed in the electrical subheading is located in this area. 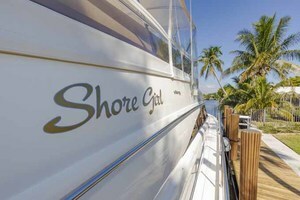 SHORE GIRL was recently acquired via a trade down from a larger vessel.That said the new owner has little or no emotional attachment to the boat.SHORE GIRL is clean, well presented and offers recently replaced teak decking, recent hull paint and a very practical three staterooms three head interior arrangement.Brought to Ft. Lauderdale to be sold! 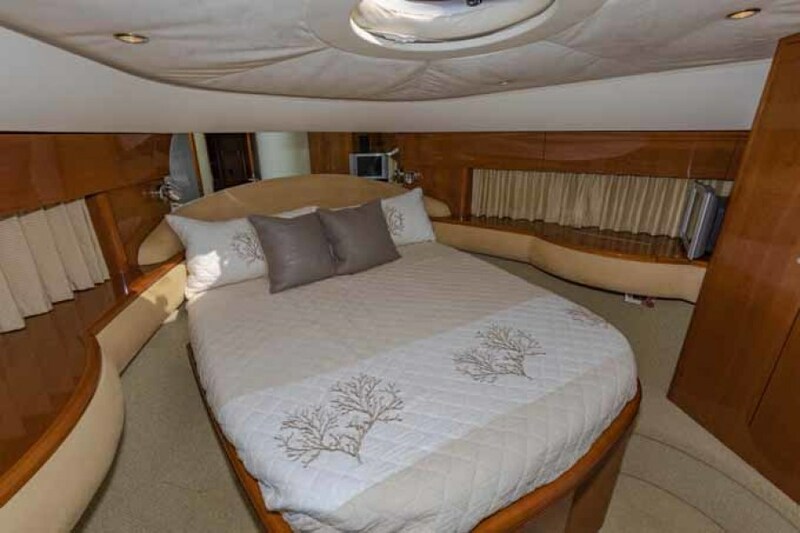 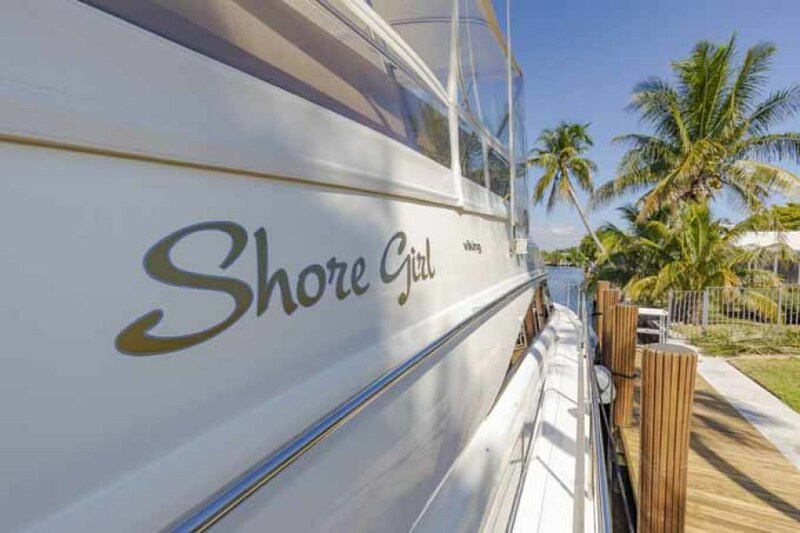 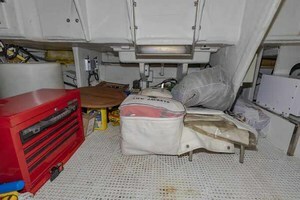 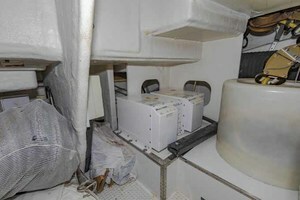 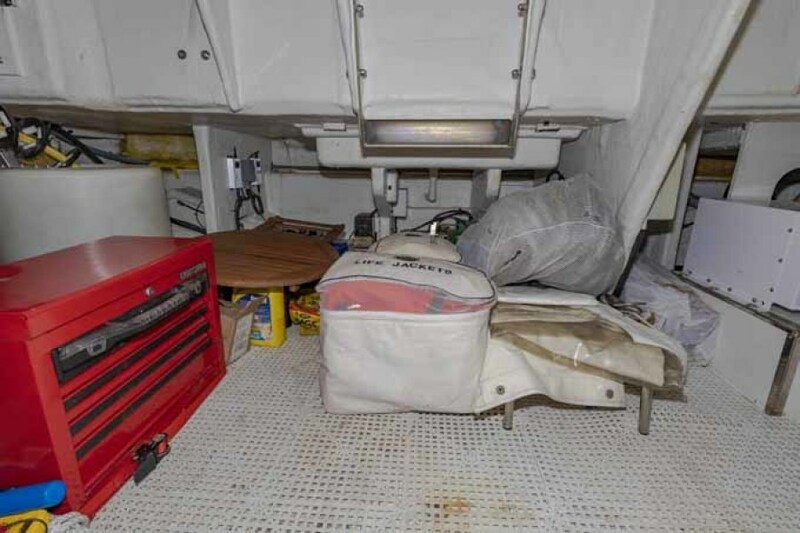 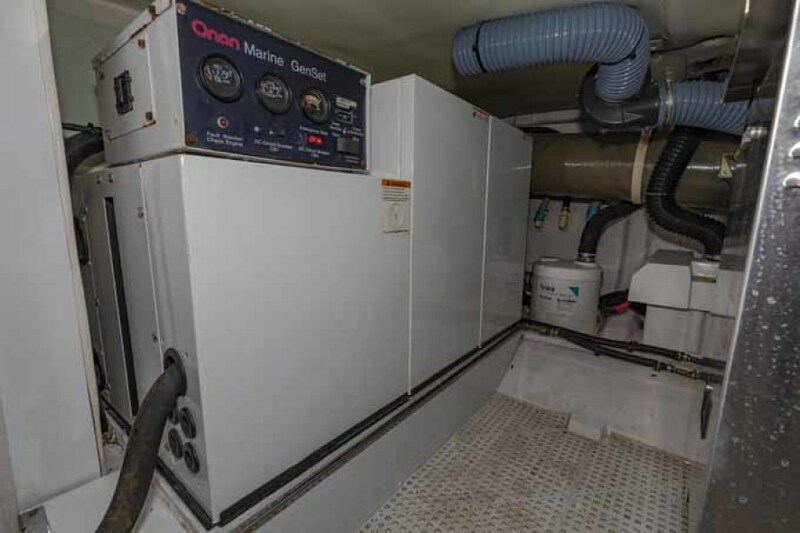 While every effort was made to list all pertinent included equipment aboard SHORE GIRL, there are some personal belongings aboard.Prospective purchasers should assume any item not specifically mentioned herein will not convey at closing.